I like being unique. I think God made all of us so different from one another so that we can teach each another from our differences. It also makes things a lot more interesting! Along with uniqueness comes unique handmade gifts. Everyone adds their own special flair. 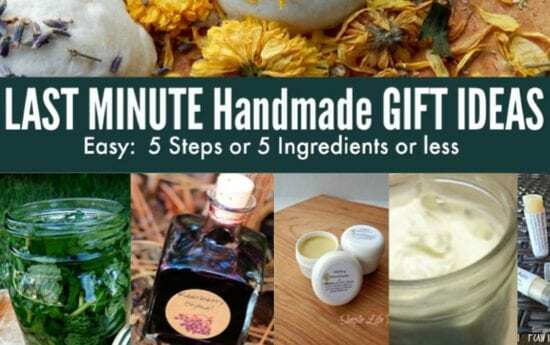 Here are 31 Last Minute Handmade Gift Ideas. And the great thing is, they all have 5 or fewer ingredients or steps to make (There may be one or two that have 6 due to additional options). Last minute handmade gifts don’t have to be boring or complex. 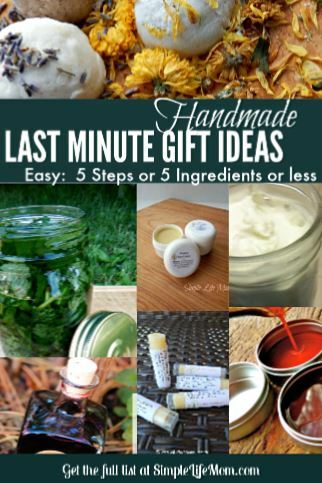 Simple is what I love, and I think you can make easy last minute gifts that stand out as special and full of love. These last minute handmade gift ideas show what you like. If you like jelly, you may want to make jelly. If you like crafts, you may want to make a handmade drawstring bag. Just make sure the person you want to give the jam to actually likes jam. I know which of my friends love herbal gifts and which think they’re being poisoned if essential oil come near them (Yes, I still love them). So, know the people you want to give to. If you don’t know what they like, then choose something general. Believe it or not, I have a friend who would reject elderberry syrup unless her doctor prescribed it (Yes, I love her too). So, I’d give her soap or vanilla extract instead (another reason why I gave you a big variety from myself and my friends). Some of these recipes are from me, others are from some of my friends. They are straight forward and fun with a variety so that hopefully you can find something that suits yours style, as well as a need of your special friend or family. Everyone loves food! I’ve included some herbal tea mixtures, as well as a few desserts for fun. Feel free to use canning jars or small bottles for packaging ideas. You don’t have to have a ton of herbs on hand to create an herbal healing salve or medicinal syrup. I know elderberry prices skyrocket once winter gets near, but I’ve found some good prices on Etsy. I’m not a very crafty person. I say that thinking of sewing, but I can kind of sew. 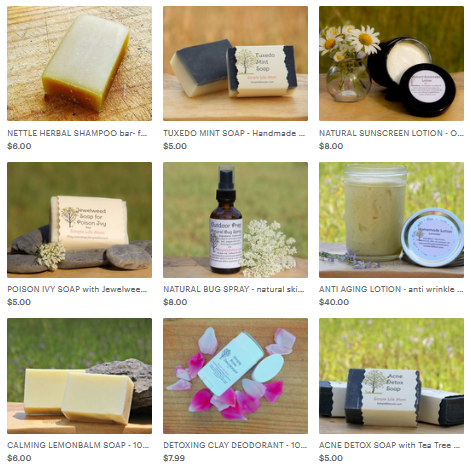 I just don’t have the patience to make a beautiful work of art….and soap making is a craft! Well, since these are last minute ideas, here’s some super fun, non “craft-person” projects that are good enough to do with a friend (highly recommend) or give away to others. 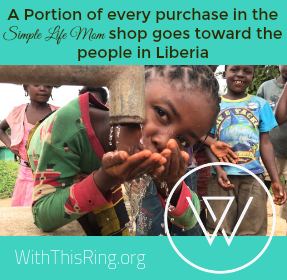 A lot of us don’t make or buy special things for ourselves that often. I’ve never been at a store and said, “I’m going to buy myself some bath bombs, salts, or scrubs and go home and soak.” It just doesn’t happen. But I will use those things if I’ve made some for someone else and have some left over or if someone gives those things to me. What are friends for, but to care for and make sure we have a little down time occasionally? These are, again, wonderful to make with a friend. Buy all the ingredients and invite a friend or your mom over and make these together, or prepare them as a surprise. They are a creamy, healthy goodness great for Christmas, Birthdays, and even Wedding events. I offer all these in a roller bottle blend in my shop. You can get your own roller bottles to use for blends at abundanthelath4u, or like these at Amazon. I hope you enjoyed all the options for Last Minute Handmade Gift Ideas. Surely you can find something on this list to try. Let me know if you have questions. I’d be happy to help.